Josey from My Cheap Version of Therapy tagged me in a little Q&A blog thing, which couldn't have come at a better time. I was home sick today, recovering from a little stomach bug I happened to get on the night before the wedding this weekend. Between being busy and being sick, I just haven't blogged much in the last week. And yes, I was home sick on my second day of work (which, by the way, so far so good). Thankfully, I'm feeling much better this evening, and finally have some food in my stomach! Without further ado, Josey's questions! 1) What is your dream occupation? I want to work in Human Resources, specifically in the areas of new hire onboarding and employee training and development. And ideally, once I have kids someday, I'd love to work from home a couple of days a week (we're talking dreams, right?). When I see friends of mine going back to work full time just a couple of months after giving birth, it makes me sad, and I'd love to be able to have a flexible enough schedule so that I'm not away from my kids 50 hours a week. 2) How many children (if any!) do you want? Two, I think. But not for another 5 years or so at least! 3) What's your favorite memory from high school? So many memories, and it seems like so long ago. I think my favorite memories are of the little things, like running to our cars and jetting to McDonald's to grab burgers in the 20 minutes between the final bell and play rehearsal. Or "12-hour Day" pins, where each cast member of the play wears a safety pin on his/her clothes to signify the first day we spent 12 hours on campus due to rehearsals (we felt so exclusive and cool). Or choir trips to San Francisco and Boston, winning trophies that we could show off when we got back (our football teams never won anything!). 4) What's the craziest thing you've ever done? I honestly don't think anything I've done would be considered "crazy" by any normal standards. Once I drank 12 mimosas at Cafe Biere (over the course of about 5 hours)...um...I rode Splash Mountain at Disneyland three times in a row when there was no line? Yeah, I'm exciting, I know. 5) Who is your idol and why? Gosh, I don't think I actually have an idol. I love Tina Fey though, and pretty much want to be her, even though I don't want her career. 6) If you could go back and change one decision you've made in your life, would you? If you're comfortable with it, please share the decision! As cliche as it sounds, I don't really have any do-overs on my list. I have a lot of want-to-dos on my list, but not a lot of wish-i-hadn'ts. 7) Stilettos or flip flops? Oh, flip flops all the way. One million percent of the time. 8) What's the #1 place in the world that you'd like to travel to and why? And a little freebie to make up for the fact that I'm not passing this on (sorry!) - this is my favorite photo from our friend Corinne's cell phone pictures from the wedding. 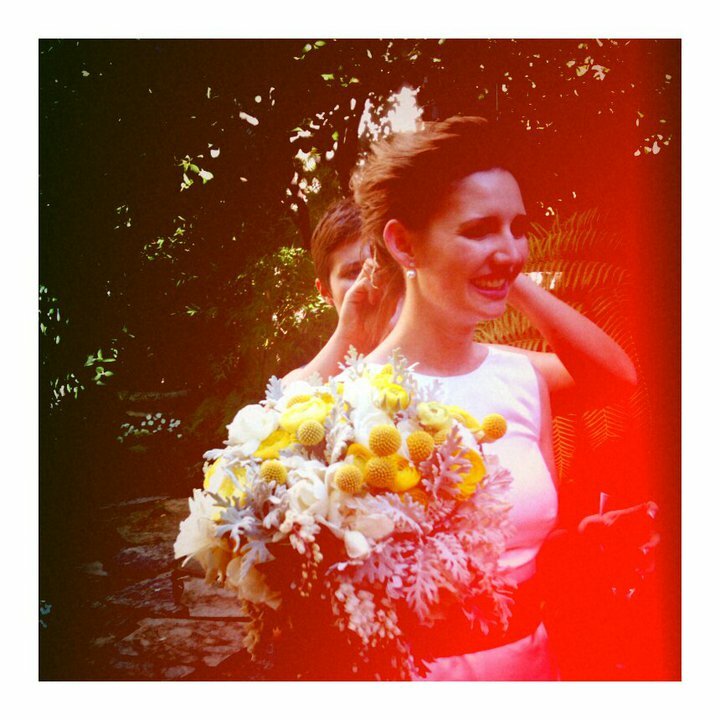 Reed is just glowing (and it's not just the camera filter) as her sister Emma fixes her hair after the ceremony. It was such a beautiful day - and I don't think I've ever seen her so happy! I'll post more pictures as they show up on Facebook and such. Your high school experiences sound a lot like mine - I'm glad not everyone responded with "I hated high school, glad it's over." I would in no way want to go back, but I had a great time in high school! Choir, musicals, math team, sports, you name it, I was in it, and I loved it!